Dealing with my own personal problems and having to move away from my home town to create a better life for myself & my daughter means that I am well aware of how much I rely on my friends for support. I understand the importance of making time for my friends and being there for them or just letting them know they are not alone because knowing you are not alone is the best thing for anyone when going through a tough time. Friends can mean the world – when you’re feeling stressed or upset, they can be a real source of support. 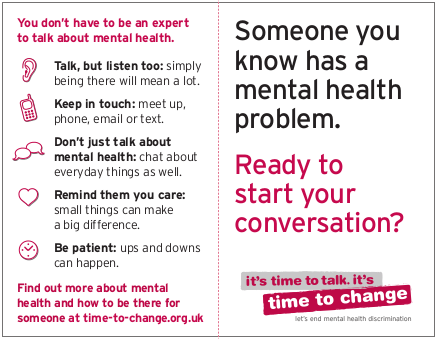 Time To Change has started a new campaign #maketime and I think it’s a fantastic idea and I knew I had to pass on the word, because it really can make a difference to someone who could be facing difficulties, it could even save them from taking their own life. Anyone can experience a mental health problem, so being able to talk about it is important to us all. You don’t need to be an expert to talk about it. And it’s often the small things you do and say that can make a big difference to someone – like asking ‘How are you?’ or dropping them a text to say hello. It will let them know you haven’t forgotten them and that your there if they need you. how stigma and discrimination can affect people living with mental health problems likedepression, bipolar disorder, OCD, anxiety, personality disorders or schizophrenia.